← Why Will the Media Want to Talk to You About Your Book? Minoti Rajput, a Certified Financial Planner and Chartered Special Needs Consultant, has served as the founding president of Secure Planning Strategies for nearly three decades. 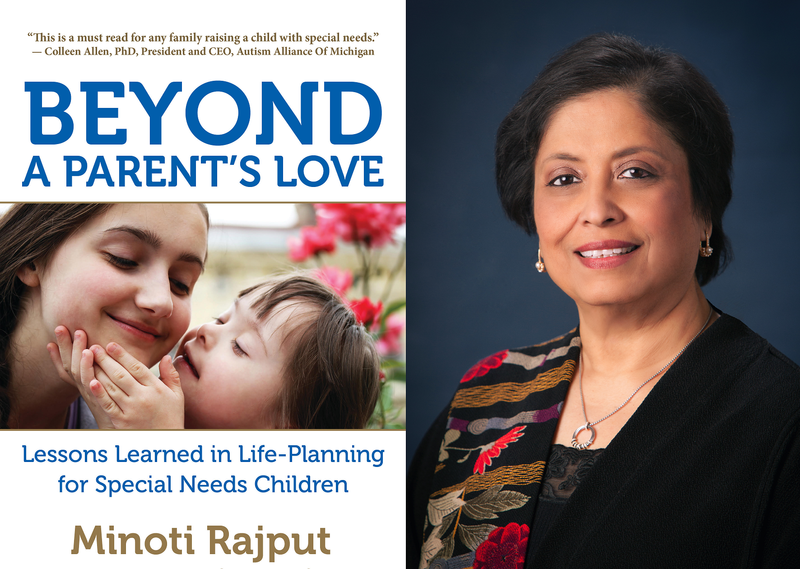 Media Connect is proudly promoting her breakthrough book, Beyond A Parent’s Love: Lessons Learned in Life Planning for Special Needs Children. Rajput, born and raised in India, studied finance and worked in banking before her arrival to the United States in 1980, helping small business owners with financial planning. In 1989 she formed her firm offering comprehensive wealth planning with a subspecialty of life planning with financial and legal guidance to families of special needs children. For the past 29 years her firm has counseled 1,500+ families of children with special needs. Her thriving practice based in Michigan, also services affluent retirees and pre-retirees, small business owners, and women in transition. Her firm, Secure Planning Strategies, represents nearly 300 clients with $330 million in assets under management. What convinced you to devote the last three decades of your practice to helping families, with special needs children, plan for the future? It was a combination of a few reasons. First, having the desire to have a sub-specialty in my practice that was more meaningful, intellectually challenging and emotionally satisfying. My niece with autism was often on my mind, and the fact that I met three different families who were clueless about their special needs child’s life after the parent’s passing. I dug deeper to find out more about this area of planning. Once I discovered the need — and saw a lack of professionals specializing in special needs planning – I jumped in. How do you begin the process when working with a family that has a child with a disability, learning disorder, or mental illness? Many of our prospective clients approach us for consultation after attending a special needs planning workshop we presented. We also get a fair number of referrals. They complete a questionnaire with details of their personal and financial information, as well as some basic information about their child with disability. The fact-finding meeting is very important. A deep probing into their family situation, abilities and inabilities of the special needs child, as well as inquiries on financial matters allows us to educate the family on special needs planning, identify planning challenges and test possible solutions. We then offer to do their planning and help them implement the plan. We introduce them to the attorney to complete the legal documents and we always attend the meeting with the attorney. Once the plan is in place we monitor it on an ongoing basis. How challenging is it to help parents deal with the emotional side of financial planning for a child that is likely to age with numerous difficulties? It is difficult in every case. Our message is the importance of planning for the parents as well as for the children with disability. The assets have to last two generation. Some families accept the reality and do the best they can. Some have emotional reaction of sadness/ anger/ frustration. They often feel that they will never get a break. Parents feel the pressure of lack of adequate support from the government and their own limited ability to do the financial planning. The fear of the unknown future when they are gone is distressing. We encourage them to do the best they can with proper guidance. What do parents need to know about government assistance programs? Parents need to be educated on this very early on. They need to understand when a child with disability can qualify for SSI, Medicaid, and many programs under the broad umbrella of Medicaid: the qualification requirements, when to apply, types of assistance, the agencies associated in their geographical area, the budget challenges and how best to work with the government agencies. Government websites, special education schools, advocacy organizations educate parents on this matter. Parents need to be careful not to miss qualifying their child in a timely manner at age eighteen, and plan never to have the child disqualify either. What’s the difference between a third-party and a first-party trust? Third-party trusts are established by the third party, such as parents or other family members, for the benefit of a child with a disability. It is funded with the assets of the third party. Assets remaining in the trust after the death of the disabled person are distributed to their heirs. First Party Trust is usually funded with the assets of the person with a disability. It must be established and funded by a parent, grandparent, or the guardian of the person with a disability, or by the court for a person with a disability under the age of 65. The trust is usually irrevocable, and the special-needs person is the only beneficiary of the trust. The trust is usually funded with a settlement resulting from a tort action or inheritance received by a person with a disability received inadvertently. Upon the death of the person with a disability, the remaining assets of the trust must be used to pay back any state medical agency providing benefits. What are some of the most important non-legal documents that detail the appropriate needs and care instructions required by the special-needs child? A letter of Intent is one of the best non-legal documents created for the special needs person. This is the document where parents describe everything in detail about all aspects of their child. The child’s abilities, inabilities, health issues, medications, allergies, food habits, insecurities, favorite things, favorite person etc., In addition, it also provides instructions of how they would like their child to be taken care of. Instructions on family visits, recreation, medical checkups, etc. This guide is extremely important for people who will be stepping in the parent’ shoes as trustees, advocates etc. Absence of this document makes the caregiving very difficult and takes a toll on the special needs child as well. What is an ABLE account and why do you not consider it as a planning tool for the long term for a person with a disability? ABLE accounts allow a person with disability to have assets in their own name with certain conditions, without jeopardizing their eligibility for government benefits. It is however, very limited, and is not designed to provide lifelong care supplement to the government benefits. It also has the state pay back language. In your book, you profiled five leaders committed to helping special needs children. What impressed you about their work? Each individual or couple has been true advocates and they continue to make a positive difference in the lives of those with disabilities. Some have been inspired by their own child/children’s needs, but they have gone further and recognized the importance of serving the disabled community at large. They continue to dedicate their time and energy in the area of finding alternate employment, residential options, advocacy, education as well as medical diagnosis and treatment for the disabled. They work tirelessly and have to often deal with the government rules and budget constraints but they continue with their mission with the hope of improving the lives of those with special needs. Having counseled over 1,500 families nationwide with special-needs children, do you see anything the government should be doing to ease the burden of financial planning? The US government, as well as the governments of other developed countries, are facing challenges in providing services to the increasing special needs population. Yes, the government in the US needs to provide options for planning a better life for the longer living special needs population. Our laws are somewhat dated and need reforms. On the other hand, taking care of a special needs child is a partnership between the government and the families. Governments will need to tax people more in order to have a higher budget for benefits, which is not an option either. The government certainly needs to have more employment opportunities for those who can work, and residential opportunities with care giving. Families need to be strong advocates and work with the government to provide the care and benefits for their special needs family member. Why do you hope your book inspires more financial planners to specialize in planning for special-needs families? I have personally experienced how families benefit from working with a knowledgeable financial planner who can provide comprehensive planning with focus on special needs planning. They can act as the quarterback coordinating all aspects of the family’s planning and guide them in the needs of the special needs child. The special needs population is large and families need capable people to help and guide them in taking care of their needs. Financial planning is a profession and also a service. I hope my book demonstrates the need and also the satisfaction of helping families that are vulnerable. It is not an easy specialization. There is a lot to learn, but it is very rewarding. This entry was posted in Interviews and tagged author interview, author Q&A, book pr, book promotion, book publicity, Minoti Rajput. Bookmark the permalink. PTA's publicity campaign took me to another level. They got terrific coverage in the New York Times and Investor's Business Daily - and propelled my book to become a bestseller on amazon.com and B&N.com. I highly recommend their services.